The objective of this project is to setup a theoretical and computational framework, based on the principles of compressed sensing, for the measurement and processing of complex acoustic fields through a limited number of acoustic sensors. The major challenge raised by this project is the need to jointly define, optimize and validate experimentally: suitable mathematical foundations for sparse modelling of acoustic fields; new nonstandard acoustic sensing devices such as sparse arrays or, in the longer term, optical line detectors or surface detectors; and efficient sparse reconstruction algorithms. In the vast majority of the above cases, the digital data processing flow is based on the simple paradigm “acquire simply, process later”. The goal of this project is to question the very foundations of such techniques, by challenging the classical sampling paradigm: is it possible to acquire less acoustic samples, each of them carrying more information? 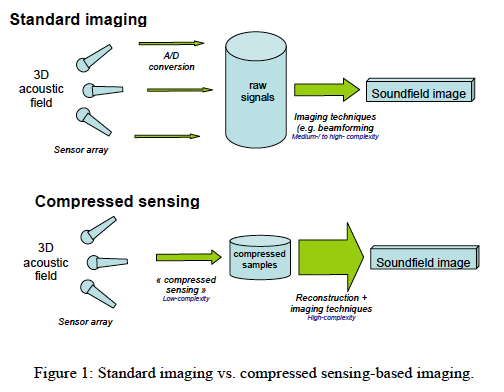 The challenge is to investigate to which extent a new mathematical theory, named “compressed sensing”, can be relevant to help build next-generation “physically-informed” acoustic sampling.